How to find loop in linked list? How to find start of the loop ? take two pointers slow and fast. keep incrementing the slow by one and fast by two. if there is a loop then eventually they meet. Why? one step to balance the lagging, one step to balance the slow’s step, one step to cross the slow. But fast can move exactly two steps. hence it can not cross. think about the position of fast when slow comes in to the loop first time, So that fast would meet slow as late as possible. the more far the fast is from slow then the more closer to slow it would be. (circular philosophy). so let me assume fast next to slow. so when slow makes half round then though fast makes one full round, still fast can not cross slow as fast is now around old position of slow(one more than that). since the speed of fast is 2 times to speed of slow. Huhhhhhh. Lets use some maths here. if slow and fast meets at point z.
total distance traveled by fast is 2* dist traveled by slow. 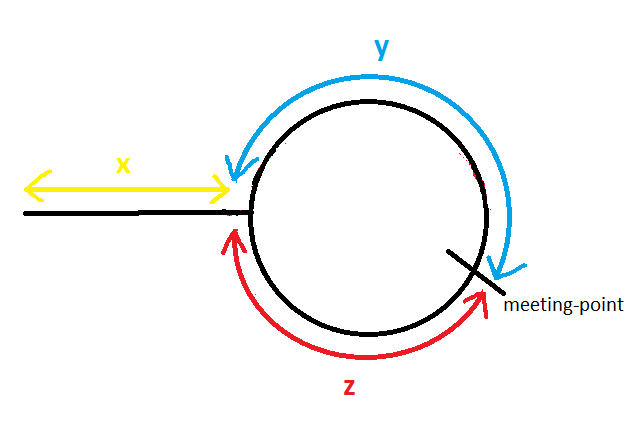 in other way it is x+ n(y+z) + z, where n is no of rounds made by fast before meeting slow. exactly after x steps slow comes to start of the loop(see picture) then by that time (x = (n-1)(y+z) + y) fast , which is in the loop, would take (n-1)(y+z)+y steps; where (n-1)(y+z) is equal to making n-1 rounds in the loop and coming back to the same position, then followed by y which moves fast pointer y steps ahead of its current position in the picture, will move fast to start of the loop. finally when start and fast meets in this process then it would be start of the loop. When it is coming to the time complexity, since slow is making only one round in the loop, assuming list size n, there are n pointer increments by slow and 2n pointer increments by fast, over all it would be at most 3n, which is O(n).